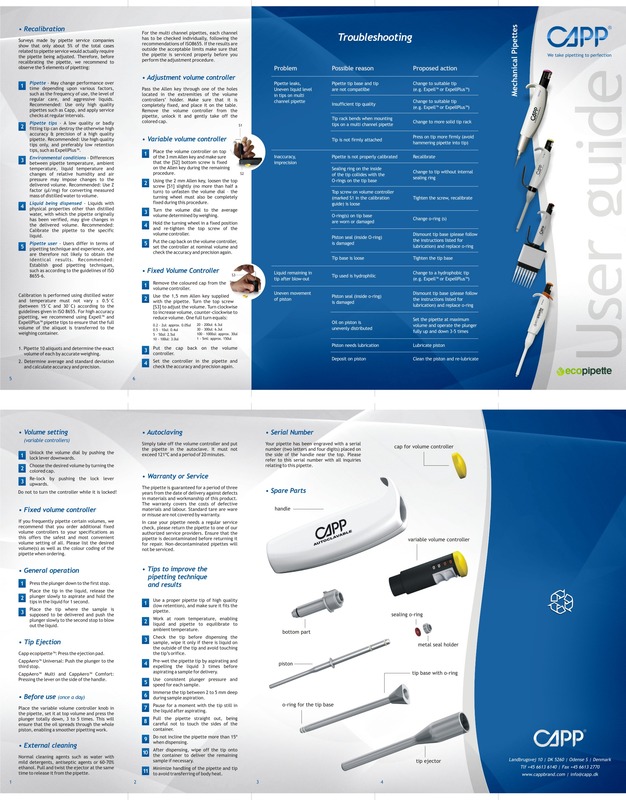 Why the CappAero Multichannel Pipette? 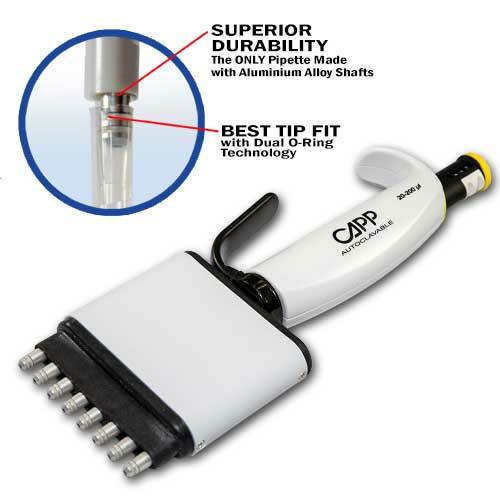 The CappAero multichannel pipette has a unique construction, ensuring extremely easy tip mounting and ejection. The CappAero Multichannel Pipette drastically reduces your workload because of its lightweight design, dual O-rings, and exceptional tip fit. 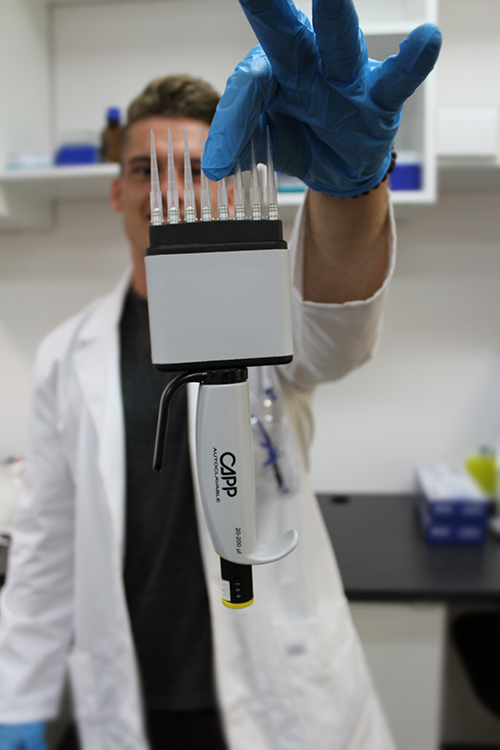 Increase your productivity and get results that are precise and dependable, order a CappAero Multichannel Pipette, today! Capp Aero multichannel pipettes are also available in a 16-channel pipette, 48-channel pipette, and a 64-channel pipette for pipetting into 384-well plates. Volume Range: CappAero Multichannel pipettes cover a volume range of 0.5 to 300 uL, depending on the model. Dual O-ring: Provides extremely comfortable tip mounting and ejection, reducing the risk of repetitive stress injuries (RSI) and increasing accuracy. Tip Fit: Exceptional tip fit due to the metallic tip cone and double o-rings, the design eliminates the need to hammer your pipette into the tip rack. 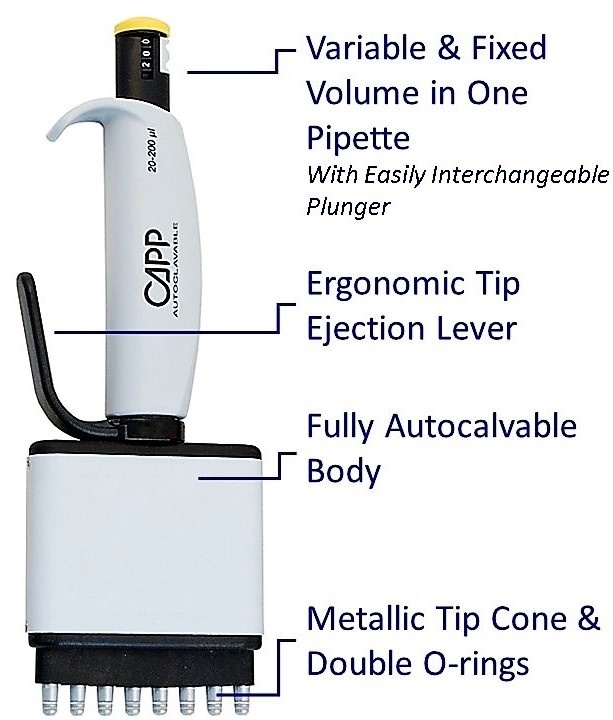 Durability: Interior components of the CappAero Multichannel pipettes are made of stainless steel and the nose cones are made of anodized aluminum and metal. Interchangeable knobs: You can change the knob to the volume you desire.